LG has sent out invitations for the launch event of LG V20 on the 6th of September. The tag lines accompanying the invitation are “play more” and the somewhat more cryptic “the second story begins“. LG hasn’t revealed much detailed information regarding the successor to LG V10. The company claims that LG V20 will “set a new standard” in the premium smartphone market “with extended multimedia capabilities“. 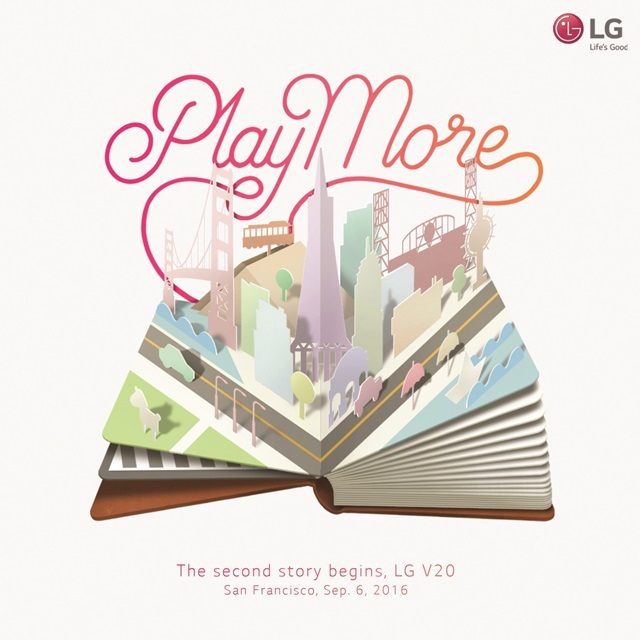 The tag line “play more” indicates that V20 will be integrated with many of the electronic devices that LG G5 users can connect to such as LG 360 Cam, LG 360 VR and Rolling Bot. The screen appears to be the same size as V10’s with a 5.7-inch large and a 1440 x 2560 resolution. V20 supports a secondary screen just like its predecessor. The rear camera sports a resolution of 21 MP and the front one a dual-camera. The phone is powered by a quad-core Snapdragon 820 processor and an Adreno 530 GPU. There’s 4GB RAM memory available for processing. LG V20 runs Android v7.0 Nougat making it one of the first smartphones in the world running the latest version of the Android operating system. A September launch might seem risky for LG since the two giants in the space, Samsung and Apple, are also releasing flagship phones that month: iPhone 7 and Samsung Galaxy Note 7.